So your ancestor was a mayor or a town council member. A local official of some kind around the middle of the 19th century. Ever wonder just what it was that he — or the town or the city — was supposed to do? What the authority was? What its concerns were? Or maybe it was just that you had an ancestor who lived in an area making the transition from rural to more urban… and you’re wondering what life was like… what people cared about. There is a place to look, you know… and, yes, you already know what The Legal Genealogist is going to say. You need to look at the laws. Because you’re likely going to find an awful lot of clues to the context of the times in those law books. As I was getting ready to head off to Manchester, New Hampshire, for tomorrow’s spring seminar of the New Hampshire Society of Genealogists (are you joining us? have you sent your email off to the [email protected] to see if NHSG can hold a space for you? 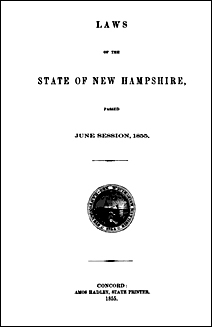 ), I came across the job description of an entire city in New Hampshire’s laws… and what a tale it tells. “1. To restrain and prohibit all descriptions of gaming, and fraudulent devices, and to authorize the destruction and demolition of all instruments and devices used for the purpose of gaming. “2. To regulate or prohibit the exhibitions of common show men and shows of every kind. “3. To prevent riots, noises, disturbances or disorderly assemblages, and to restrain and suppress disorderly houses, and shops, and houses of ill-fame. “4. To compel the owner or occupant of any cellar, tallow chandler’s shop,, soap factory, tannery, stable, barn, privy, sewer or other unwholesome or nauseous house or place, to cleanse, remove or abate the same. “5. To direct the location and management of all slaughter houses, markets, steam mills, steam engines, black-smiths’ shops, and buildings or places for storing powder. “6. To regulate the keeping and conveying of gun powder, and other combustible and dangerous materials, and the use of candles and lights in barns and stables. “7. To prevent encumbering the streets or sidewalks with carriages, carts, lumber, fire-wood, stones, or any other thing what ever, and to prevent the obstruction of sidewalks and bridges, by persons collecting or gathering together, and to regulate the erection of buildings. “8. To restrain and punish vagrants, mendicants, street beggars and common prostitutes. “9. To prevent the running at large of dogs, and to authorize the destruction of the same when at large contrary to the ordinance. “10. To regulate and restrain the rolling of hoops, playing at ball, or playing kites, or any other amusement or practice having a tendency to annoy persons passing in the streets and on the sidewalks, or to frighten teams and horses within said city. “11. To regulate the ringing of bells, and regulate or prevent the blowing of horns and bugles, and crying goods and other things, therein. “12. To require all persons to keep the snow, ice and dirt from the sidewalks in front of the premises owned or occupied by them, and to abate and remove nuisances. “13. To regulate the burial of the dead. “14. To regulate guaging, the place and manner of selling and weighing hay, packing, inspecting and branding beef and pork, and of selling and measuring wood, lime and coal ; to appoint a suitable person or persons to superintend and conduct the same. “15. To regulate porters, cartmen and cartage, and hackney coaches, cabs and other carriages and their drivers. “16. To prescribe the powers, authorities and duties of marshal, assistant marshals, police and watchmen of said city. “17. To establish, regulate and make public pumps, wells and reservoirs, and to prevent the unnecessary waste of water. Now some of these things we might all have thought of — burying the dead, for example, would be a real concern to folks in the towns. But without reading the law, I for one might not have considered just how much of a nuisance those hoop-rollers or kite-fliers might have been in 1855 Dover. Just reading the list of concerns the City was allowed to address tells me something about life at that time I might not otherwise have known. What are you getting that you want to unsubscribe from and at what email address?